When I was asked out on a date a few nights ago, my first thought wasn’t just “Yes.” it was, also “HOLY JENKIES BATMAN!!! I need a facial!” I wanted a specific type of facial. One that had light extraction, brightened the skin, and of course, postponed any aging processes my skin could be undergoing as you read this article. And let’s not forget, a facial that did all of the above and didn’t leave my Coach wallet in a cast. 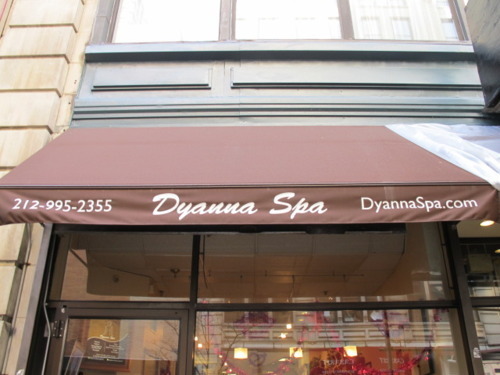 Enter in Dyanna Spa, located just off Park Avenue. 1. The Caviar facial and 2. The Placenta facial. While I’m a huge lover of caviar (one of my pitfalls as a vegetarian.) I’m not sure I would be able to sit through this facial without being tempted to lick it off or sneak a few finger dips in the jar. Being that I also love to try new and unusual things, I opted for the placenta facial. This placenta is from sheep and helps rejuvenate the skin. I assure you, the temptation to lick anything off quickly dissolved. I walked in and met with a warm and friendly blonde esthetician by the name of Alla. 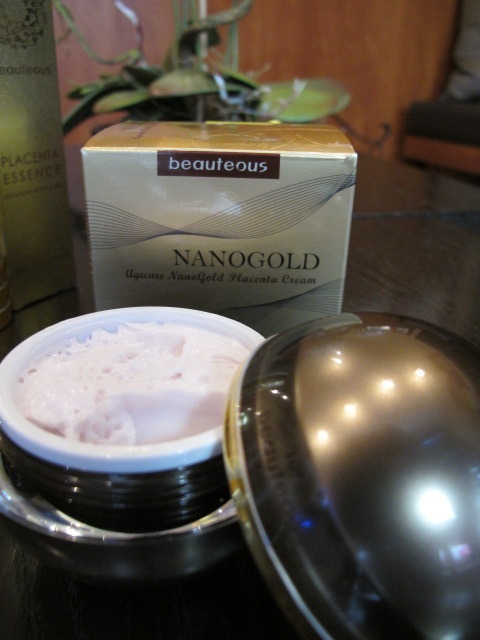 She explained the benefits and purpose of the placenta facial, while showing some of the products used. By the way, these products come all the way from New Zealand. OoOoOH imported goods! 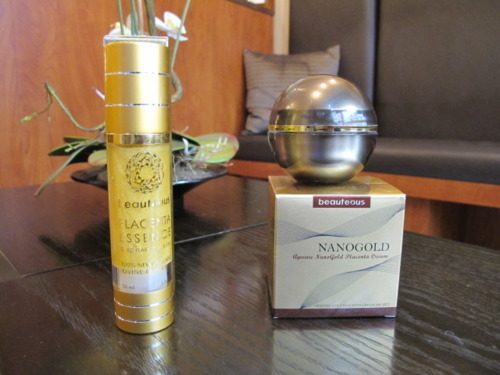 The slender gold bottle is a serum containing flecks of 24 karat gold and the cream inside the ball, is thick and has a nice whipped cream like texture to it. Alla continued to talk about the placenta facial being one that hydrates the skin, smoothes wrinkles and promotes collagen growth while helping restore skin elasticity. She didn’t have to continue, I was already stoked about getting sheep placenta slabbed all over my face. We walked into a cozy oasis perfect for two. With light sounds of nature playing as ambient sound I changed and laid down, eager to begin. 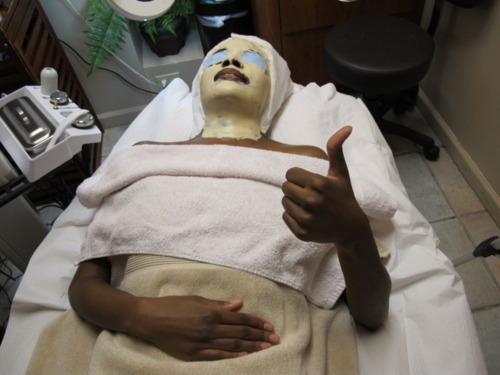 The facial began with the basics: skin analyzation, face wash, light exfoliation. Once that was over, the steaming began. This happens to be one of my favorite parts of any facial. I enjoy having hot steam gently blown over my face. (Don’t judge me. It just feels good.) She left me alone for a few minutes, which I definitely appreciated. Some estheticians like to stick around and gab your ear off or try to sell you products. Alla, did none of the sort. Thank God. She returned to our little room and began to apply the piece de resistance: the placenta mask! You can see how excited I am! This mask went on like a smooth, thick, cold layer of silk, if I could give it a texture description. The hardening part of this mask had no drying or flaking. It didn’t get crusty and itchy like some masks do. This stayed smooth till the very end and peeled right off. While some mask removals feel as if every tiny hair on your face is being ripped out, this one, I’m happy to report, did not. Once the mask was off, Alla held the mirror to my face. Though I’ve had facials before and know no results are instantaneous and or immediate (as in that very day) I was still excited to see if any changes had been made to my face. I knew my problem spots and wondered if any were gone! And of course, no magic wand came and made my blemishes instantly go away, but I will tell you this much, the facial left my skin feeling smooth, clean and refreshed. My skin looked brighter, a bit tighter, hydrated and had a healthy shine, not greasy or oily. Ready to face the day, I left happy, satisfied and excited to see results in a matter of days. I bet you’re probably wondering if my date noticed anything! Well, he sure did and it made me glow even brighter! The video is soon to come! so stay tuned and glued to my site. Thanks Alla and thanks Dyanna Spa!